In early June, I flew to Seattle for a short vacation from work. It rained almost the whole time I was there. But, that was good, because I read three books and was able to get 3/4 done with my latest quilt project. 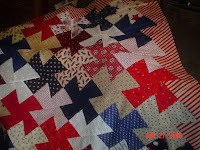 The quilt is called "Square Dance" and you basically sew 6-1/2 inch blocks together and then cut it apart and re-sew it. The photo on the left shows what you get when the second step or "re-sewing" is done. If you check back on the post prior to this one, you will see what the project looked like when I had completed the first step - sewing the 6-1/2 inch blocks together. This is really a very simple quilt to make! What a beautiful quilt! I can't imagine piecing a top to cut up. I think I would chicken out before I could pick up the rotary cutter. What size squares did you cut the top into? I have a special template that is about 5 inches square. There are marks on the template that help me place the template in the same place for each cut. This was a class I took. I purchased 3 templates of various sizes from her. I am planning on using the smaller template (possibly 3 inches) to make pillow shams to go with the quilt. Thanks for your comments. I was chicken to begin cutting at first too, but it became easier as the quilt "grew".